Knives have been made in Solingen, Germany for centuries. Wusthof and Henckels are the top German knife manufacturers. Wusthof is owned and run by the Wusthof family. 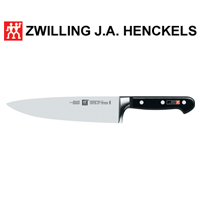 Henckels, now known as Zwilling J.A. Henckels, is a conglomerate and owns a variety of companies, including Staub cast iron and Demeyere cookware, as well as the revered Zwilling J.A. Henckels brand. German knives come in forged and less expensive stamped versions. Most have a cutting angle of 14 to 22 degrees. Rockwell hardness ranges from 56 to 58, a measure of a knife's strength and durability. 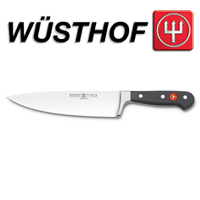 Choose from a variety of top quality Wusthof knives. They make butcher knives to paring knives to chefs and cooks knifes. Wusthof also has many specialty knives, such as bread knives, a salami knife, even salmon slicers or ham slicing knives. Zwilling J.A. Henckels knives come in a wide range of handle styles, blade functions and prices. 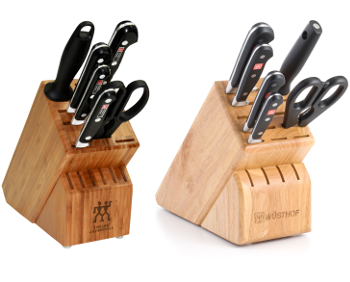 Select a traditional 3-rivet German design with Pro S. Or an up-to-the-minute Asian-inspired Miyabe knife.